I came to New York to go to design school.The city offers endless inspiration with its NYC street art making everything around you an urban gallery. The colors and textures of the murals act as a frame for the style and fashion on the sidewalks. When Perrier asked me to share the work that I love, I jumped at the chance. My favorite mural in the city has to be the Eduardo Kobra work in the Chelsea area of Manhattan. I love strolling south along the elevated Highline Park and seeing the bright colors of his second story window unveiled through the trees. It is a romantic piece, his rendition of the famous Times Square photograph of the VJ Day kiss. In a city of such great work, the walls act as a frame for the pavement runway. The galleries in Chelsea continuously churn out fashionable people who stride from side to side to admire the next artistic genius. 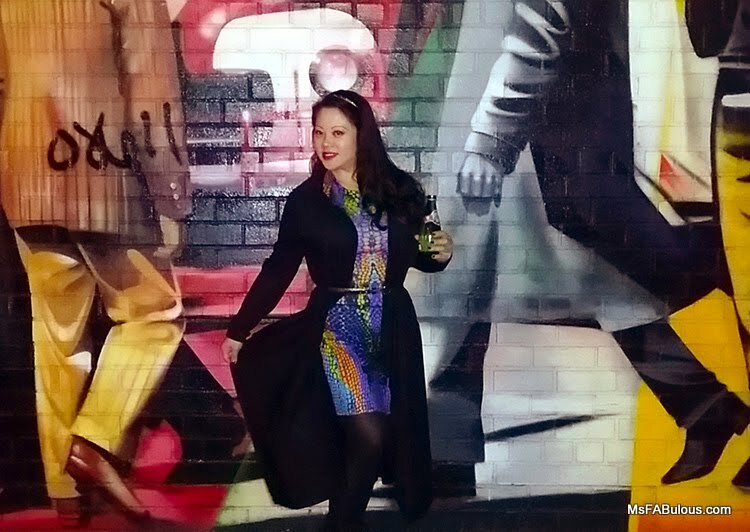 I wanted to pay tribute to the psychedelic color palette of this Brazilian artist when I climbed down off the Highline to pose in front of the street level mural of vintage cars and pedestrians. I didn’t know it at the time, but Kobra was one of the artists chosen by Perrier to redesign their bottle and label. He helped bring the spirit of graffiti and a Technicolor touch to their new campaign. Perrier was clearly as inspired by his work as I was. 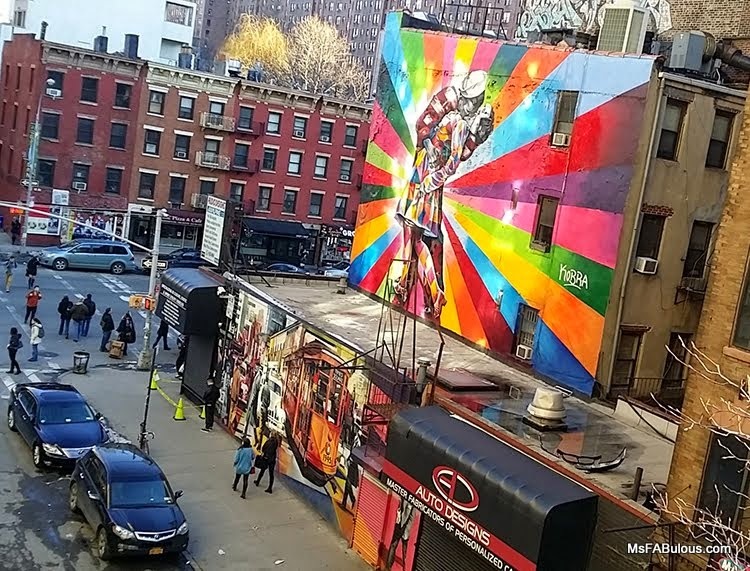 I see how the super bright colors of Eduardo Kobra art merge seamlessly into the dark industrial edges of New York. The fashion industry is often chided for our love of the color black as a uniform. Seeing Kobra’s work showed me how to style the most exaggerated of hues with my staple noir wardrobe. In this world, everything else is the new black.